Cartoonist Steve Streza posted a tweet claiming that an extortionist would release his “tax id, tax forms, SSN, [and] DOB” if he did not pay one bitcoin to a certain bitcoin wallet. 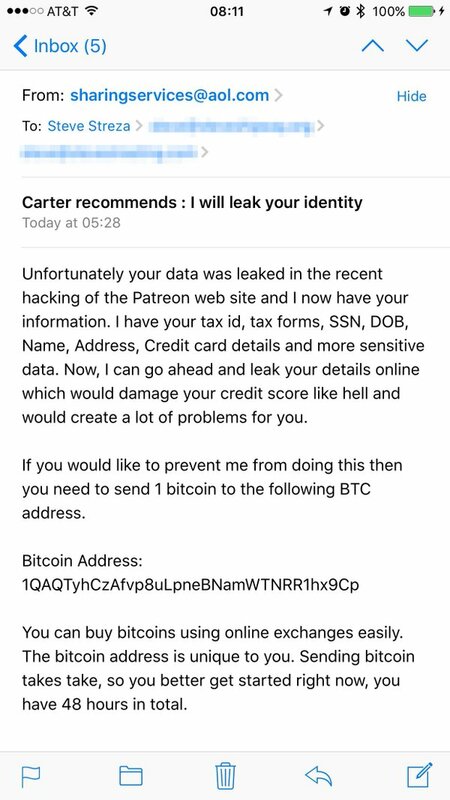 The extortion is quite ham-handed – there’s no way to confirm payment, for example and it’s not clear how much of the data was actually leaked in a recent Patreon. The emails went out this morning – I received one at 2am – and appears to marked as spam for most users. The email appears to have been sent through an AOL mail relay from the IP address 172.29.108.145. The return address is on a closed server with the domain name actaz.com. The wallet, 1QAQTyhCzAfvp8uLpneBNamWTNRR1hx9Cp, is not at all unique and contains no bitcoins. While the danger of your “SSN” leaking is often quite real, it seems this is more an empty threat than a true attack.